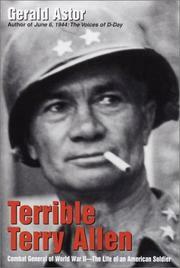 A ripsnortin’ life of an unorthodox—and barely tolerated—American general. Nearly 400 Americans held the rank of brigadier general and above in WWII, but only a few are widely remembered today: Patton, Eisenhower, Bradley, Smith. All figure in the pages of this narrative by popular military historian Astor (The Greatest War, 1999, etc. ), which commemorates the life and achievements of one Terry de la Mesa Allen (1888–1969). Though an army brat familiar with the sometimes-impenetrable ways of military culture, Allen was an unlikely success as an officer. He flunked out of West Point twice, yet distinguished himself as a combat commander during WWI, bringing idiosyncratic ways of leadership to bear on the job; when, for instance, a junior officer complained that a planned attack amounted to suicide, Allen shot him in the behind, saying, “There. You’re out. You’re wounded.” (The attack was a success, costing only 20 casualties.) Allen rose to command of the 1st Infantry Division, the “Big Red One,” but was removed from his post during the Sicilian campaign owing to the riotous habits of his soldiers, which the brass believed Allen encouraged. (“Once we’ve licked the Boche,” Allen was alleged to have said to his men in North Africa, “we’ll go back to Oran and beat up every MP in town.”) But Allen, admittedly no by-the-book officer, had to sit out only a small portion of the war before returning, this time in command of the tough-as-nails 104th Infantry Division, which distinguished itself in battle after battle across France and into the German homeland, where it eventually linked up with Russian forces on the Elbe River and crushed the final remnants of Nazi resistance. Hard-drinking, hard-fighting, beloved by his troops: Allen has a fine chronicler here—fans of Band of Brothers ought to snap this up.